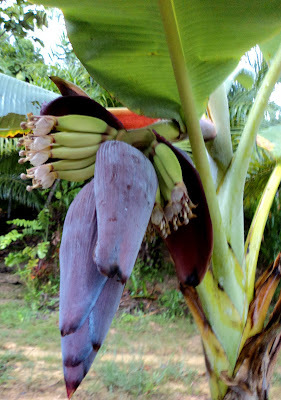 Bananas come from plants of the genus Musa, which is originary to south west Asia. It was first cultivate there some 7.000 years ago. The plant grows in tropical climates, up to 7. 5 metres high and can render up to 40 kms of fruit per year without needing fertilization. Its leaves are really big, up to 3 metres, and can be used for decoration purpose. In spite of these dimensions, banana is not a real tree, but an herbaceous plant: the largest of them all. The fruits we eat are seedless and pertain to the 'Cavendish' cultivar. They are picked and ship when still green, sent to the destination country in chilled containers (at 14ºC) and ripened afterwards using ethylene gas, their natural ripen agent. Some companies are developing different transport methods, without refrigeration. Shipping of ripe bananas ends in large damages and loses. It is this need for business infrastructure what lies behind the incorporation of odd players to Fair Trade. Labels: the genus Musa. (at 14ºC) .